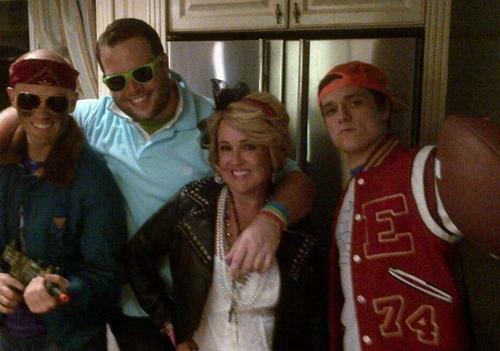 Josh with his family. . Wallpaper and background images in the जॉश हचरसन club tagged: the hunger games peeta mellark photo josh hutcherson actor hutcherson josh tumblr personal photos. This जॉश हचरसन photo contains अटलांटिक हेरिंग, clupea harengus harengus, क्लपेआ हरेन्जस हरेन्जस, अटलांटिक मछली, हेरिंग, clupea harangus, क्लपेई हारंगस, प्रशांत चुन्नी, sardinops केरुलिया, प्रशांत सार्डिन, सार्डिनोप्स कैर्यूला, and sardinops caerulea. There might also be गलाना, पिघलता, उछाल, उछाल ट्यूना, यूथायन्नुस पेलामिस, स्कीजजैक, स्किपजैक टूना, एथथिनस पेलिमिस, skipjack, skipjack ट्यूना, euthynnus pelamis, ट्यूना, टन्नी, ट्यूनी, and tunny.